Yardwork season is here in the Northern hemisphere, and for those of us blessed (or cursed) with lawns, that means time spent every week with loud, monotonous mowing, trimming, and leaf blowing. What if you could shut out the noise while also listening to something more interesting, like an audiobook, podcast, or maybe just some music? You could put earbuds in and slap some hearing protection over top, and for many people, that might work fine. But earbuds aren’t for everyone, and in my experience, AirPods and earmuffs work together poorly, if at all, because the earmuffs often knock the AirPods out. So why not roll hearing protection and headphones into one product? 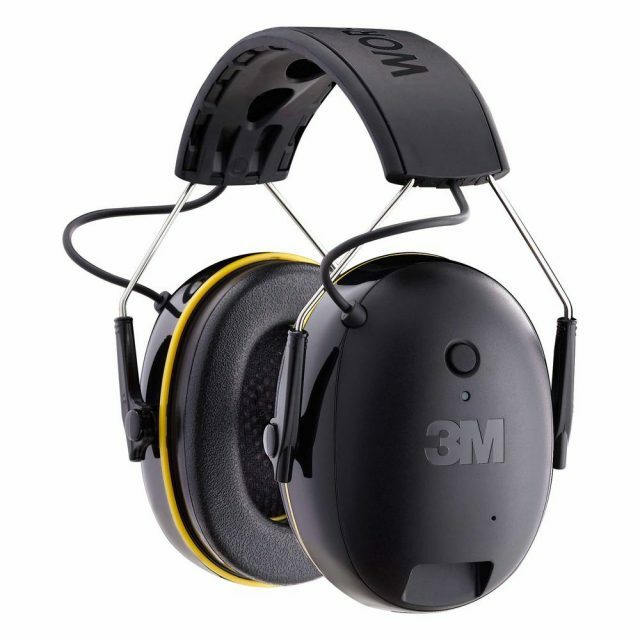 That’s exactly what the 3M WorkTunes are, and you can buy them from Amazon for around $50. I’ve owned a pair for about a year. Thanks to a built-in battery and Bluetooth, you can use the WorkTunes entirely wirelessly, which is important for eliminating cables that could catch on something while you’re working. Of course, you can’t escape cords entirely. The headphones charge through a micro-USB port, and a standard 3.5 mm auxiliary port lets the WorkTunes connect to non-Bluetooth audio players. The WorkTunes advertise an 8-hour battery life, and they hold a charge well. I turned mine on for the first time in months and was pleased to see that they still had a full charge. I know this because when you turn on the WorkTunes, a voice tells you through the speakers what the charge level is—”battery high” in this case. The voice also provides feedback when you connect to a device, like an iPhone. Despite having a built-in rechargeable battery, the WorkTunes weigh a reasonable 12.3 ounces (349 grams). The padded ear cups are comfortable, and the headband easily accommodates large heads like mine. I usually wear the WorkTunes with some sort of hat and sunglasses. The WorkTunes have a built-in microphone for phone calls, but you’ll sound like you’re talking from the bottom of a well. Then again, you probably don’t want to make a phone call when in the environments the WorkTunes are designed for. Alas, you can’t use the microphone with Siri, though “Hey Siri” still works if your iPhone is close by. The one big downside to the WorkTunes is that Bluetooth reception is painfully weak, something many user reviews have mentioned. If I put my iPhone in a pocket with any other metal object, like keys, the WorkTunes regularly cut out, which doesn’t happen with my AirPods or other Bluetooth devices. So when I’m mowing, I move my iPhone to my back pocket, which mostly eliminates the problem. Sound quality is acceptable. Not horrible, not great, just alright, but you’re wearing these while you’re working, so it’s not the main thing on your mind. My main issue with the sound is that the output volume is limited to 82 dB, undoubtedly for safety reasons, but that means I have to max the volume to hear podcasts over my lawnmower. The noise reduction rating (NRR) is 24 dB, which is on the lower end of the scale for earmuffs, which usually range from about 20 to 30 dB. To figure out how many decibels hit your ears, simply subtract the NRR from the noise level (which is possible because these are earmuffs, which aren’t as prone to user error as earplugs, per audio expert and TidBITS contributor Geoff Duncan). Lawnmowing usually runs around 90 dB and the WorkTunes (assuming you wear them correctly and for the full duration), will reduce that to 66 dB. How good is that? 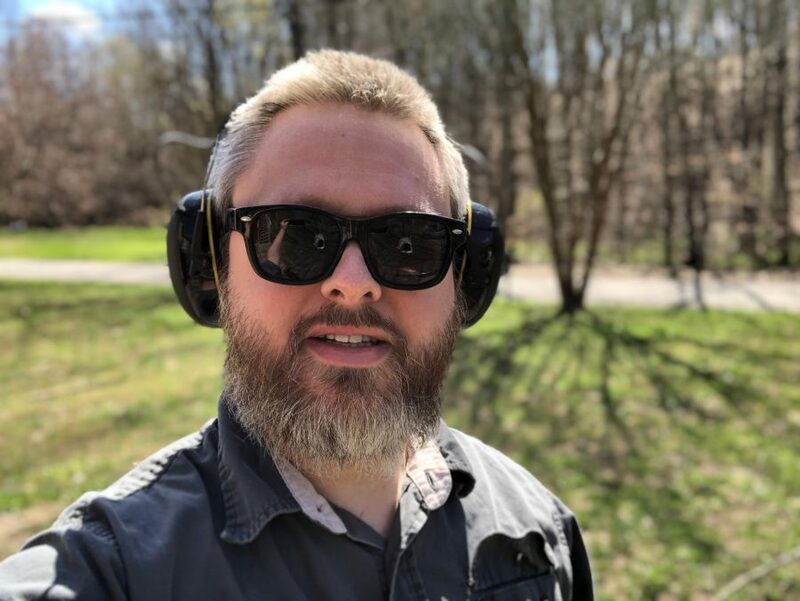 Experts generally agree that continuous background noise is harmful at around 85 dB (of course, that depends on how long you’re exposed to it), so the WorkTunes do well for yard work, but I wouldn’t recommend them for the gun range. An unsuppressed .22 caliber rifle shot is around 140 dB, and that’s about as quiet as firearms typically get—a 120 dB thunderclap can cause instant hearing damage. The WorkTunes would reduce .22 caliber gunfire to 116 dB. I also wouldn’t wear the WorkTunes while running. Besides the size, the WorkTunes’ NRR would isolate you from engine noises and other warnings of potential hazards. 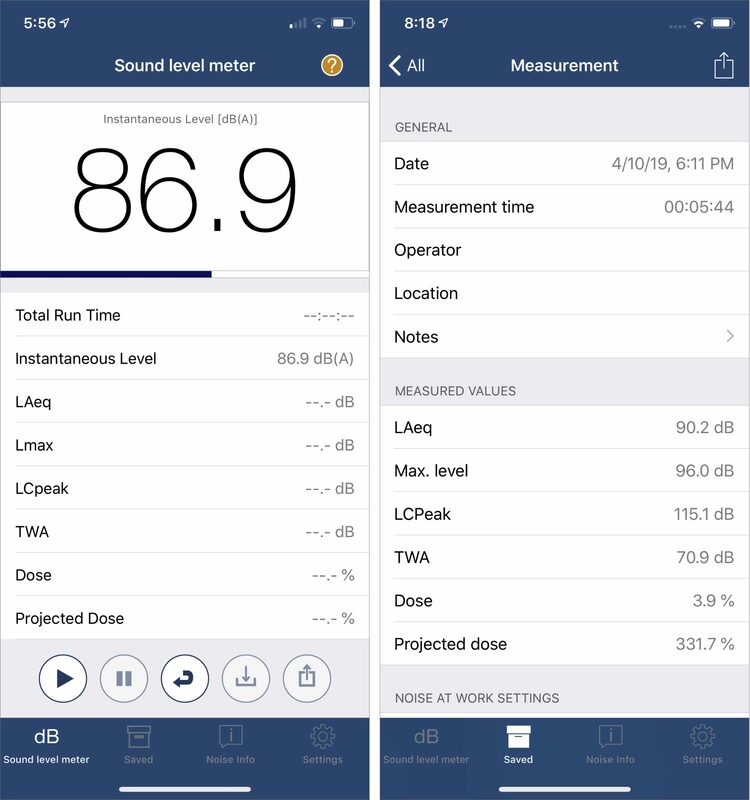 To see if the 90 dB estimate for lawnmowing is accurate, I downloaded the NIOSH SLM iOS app and did a little mowing while running the app from my shirt pocket. A dedicated sound level meter would be better, but NIOSH claims accuracy within ±2 dB. On the left is a reading taken during my mowing session. On the right is the saved data from that session. While the mower was running, the sound level hovered around 90 dB, so the general estimate is pretty good (I was using a Cub Cadet push mower for those of you keeping score at home). Over my 6-minute session, the maximum sound level detected was 96 dB, but the A-weighted average (LAeq, which cuts off the higher and lower frequencies that people generally can’t hear) over the period was 90.2 dB. But the WorkTunes aren’t merely hearing protectors, they’re also headphones, which complicates the calculation of how much sound is reaching your ears while they’re in use. Since decibels are computed logarithmically, you can’t just add the suppressed noise level of the lawnmower (66 dB) to the maximum output of the WorkTunes (82 dB). Thankfully, there’s a handy online calculator that can handle the math and give us the right answer, which is 82.1 dB. As I mentioned above, experts like the Centers for Disease Control agree that noise levels of 85 dB can cause hearing damage when experienced for more than 2 hours at a time. My regular hour-long mowing stint at around 82 dB probably isn’t good for my ears, but it’s still an improvement over the raw 90 dB output of the mower. Anecdotally, I’m less tired when I finish mowing, and I get to listen to whatever I want while working, so for me, the WorkTunes are a win. However, if you spend a lot of time using a lawnmower, weed trimmer, or leaf blower, I’d recommend a more effective hearing protector, probably one without a built-in audio player. And as I said previously, if you’re doing something that involves intense sounds, like firing a gun, the WorkTunes won’t provide sufficient protection. But for the average person who spends a few hours a week mowing or doing other loud lawn work, the WorkTunes can help protect your hearing and make your chores a bit less tedious.